About a year ago, team MTB Egypt sat down and discussed riding plans for summer 2011. A few ideas were considered: Colorado, USA, Spain and the Alps were shortlisted. 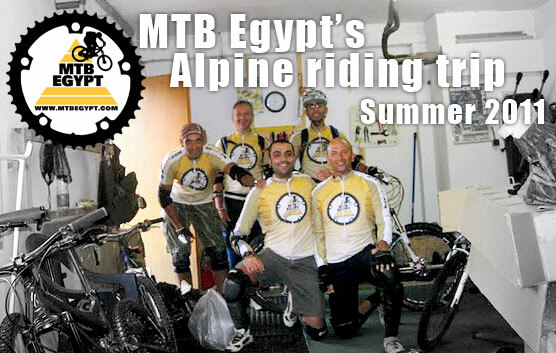 It was not until May 2011 that we decided we were going to the Alps for our first MTB Egypt riding trip abroad! So, on June 25th 2011, we found ourselves on a plane heading to Geneva, Switzerland, where Darren of Mountain Bike Breaks was going to pick us up and take us to Chatel, France. About to board the flight in Cairo. Left to right that's me (Hani Morsi), Sheif Taymour and Samer Behnam. Mohamed Kandil is behind the camera. Waiting impatiently at the luggage carousel in Geneva, hoping the all the bikes arrive in one piece! I was the designated slave for the way out of Geneva airport, check out how many bike boxes I am pushing. We haven't even seen any mountains yet, but we're already too excited! At the Chalet in Chatel, we wasted no time unpacking and putting together our bikes.